The legitimacy and effectiveness of online hunter education programs has been questioned by many since the very first course was launched years ago. However the HunterExam.com online hunter safety course, now used in over 25 states, is proving that online programs can be quite successful in teaching the basics of firearm and hunting safety. Our course is made to teach and mould good hunters, and the best way to do that is by having them answer as many exam questions as possible. 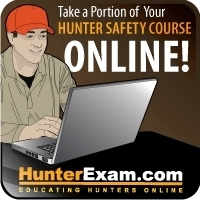 HunterExam.com's internet-based hunting safety course has been available in a number of states for over a year now, and has redefined the standards in online hunter education. The program has pushed the boundaries of e-learning, and more hunter education instructors now agree that the online hunter education program is an extremely effective way to teach students. After completing an online course, hunter safety students must attend an instructor-led Field Day or Follow-up Class where they complete some hands-on activities (including live-fire in most cases) and a final written exam. Instructors across the country are very pleased with the performance of students who have been through the HunterExam course before the Field Day. Most of these students are found to be extremely well-prepared for the Field Day activities, and are obtaining very high scores on the hunter safety certification final exams. Kerry Moher, VP of Business Development with HunterExam.com is enthusiastic about this news. "Obviously we wanted to build a course that students would enjoy taking, and it looks like we've succeeded. Students are scoring an average of 88% on the end of chapter quizzes in the online course, and all the instructors I've spoken with tell me that anyone who shows up to the Field Day with a HunterExam voucher is extremely prepared for the final exam." With a high focus on interactivity and a well-rounded education structure, the HunterExam.com course features a study guide that is fully narrated, contains over 400 detailed illustrations, and over 60 interactive animations that cover every aspect of hunting safety and hunting ethics that students encounter at the Field Day and out on the hunt. End of chapter quizzes are used to help ensure students understand the course material fully before they move on. "Our course is made to teach and mould good hunters, and the best way to do that is by having them answer as many exam questions as possible." Adds Moher, "At the end of our courses, students will have answered a minimum of 110 hunting-related exam questions (each one accompanied by helpful visual aids), and that's before the Field Day where they take the final exam!" Certain state hunter education agencies are now very confident in HunterExam students' abilities and have revised the Field Day requirements for these students. In New Jersey, for instance, students who have taken the New Jersey Hunter Course Online are not required to attend the "Field Walk", which is required for students who complete a home-study workbook instead of the Internet course. (however these students may still attend the walk if they so choose). After completing the West Virginia Hunting Course online, students simply need to schedule a practical exam session with a DNR-certified instructor. There is no "Field Day" to speak of. Again, HunterExam students are doing quite well at these exam sessions. To find out more about online hunter education programs, please visit http://www.hunterexam.com/usa/.